That’s the way “Gifts from the Enemy” begins. 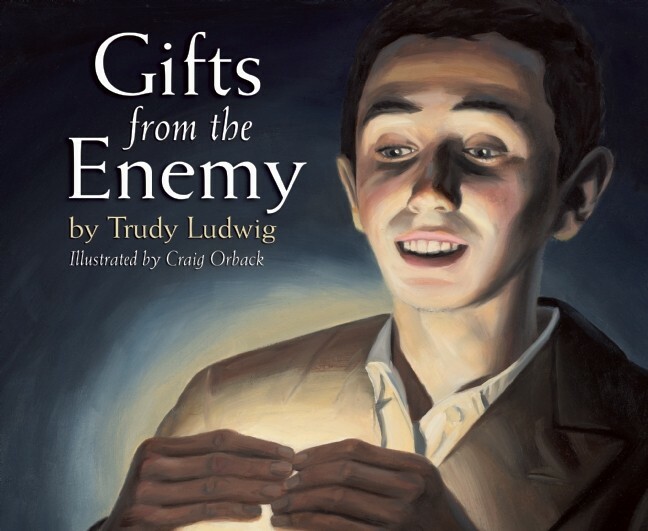 The picture book for children was written by Trudy Ludwig, and the beautiful oil painting illustrations were done by Craig Orback. White Cloud Press is the publisher. The book is a true story, based on “From a Name to a Number: A Holocaust Survivor’s Autobiography” by Alter Wiener. Then on Sept. 1, 1939, everything changed. Nazi soldiers attacked Poland, and the people had nowhere to go. Hitler ordered the army to “seek out, imprison and destroy” people who weren’t like his people. It didn’t matter if they were young or old. At the top of his list were the Jewish people who lost their freedom and rights. But then one day while he was working in a factory, he received an extraordinary gift from a German worker. The woman made eye contact with Alter as she pointed to a wooden box. When no one was looking, Alter looked under the box. He found a bread and cheese sandwich. He ate it in a hurry, before anyone noticed. And then for the next 30 days he found a bread and cheese sandwich in the same place. Despite warnings, which were posted in the factory, not to have anything to do with the prisoners, the woman risked her life for Alter. He did not know why, nor did he ever discover her identity, but through this German lady’s actions, Alter learned a lesson about stereotyping. This book is a great resource for the classroom curriculum. It is an age-appropriate tool for teaching children about the Holocaust but also for teaching children about kindness and compassion. At the end of the book, the reader finds a paragraph devoted to “The Holocaust & A World At War,” a vocabulary, questions for discussion and recommended activities for young readers. There is also a dedication. This is a touching book, a must-read. It can be found in the Children’s Room with the new books at the Moffat County Library. The hardcover book costs $16.95.